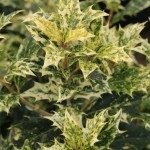 A dense rounded shrub with spiny, glossy dark green leaves that are speckled with gold and cream. The new growth is pink to bronze tinged. 'Goshiki' is Japanese for 'five colors' or 'variegated colors' which aptly describes this plant. 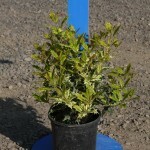 Makes an excellent screen or barrier planting. 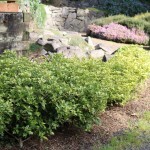 Plant in full sun to part shade in average soil that is well-drained. Prune lightly if needed.